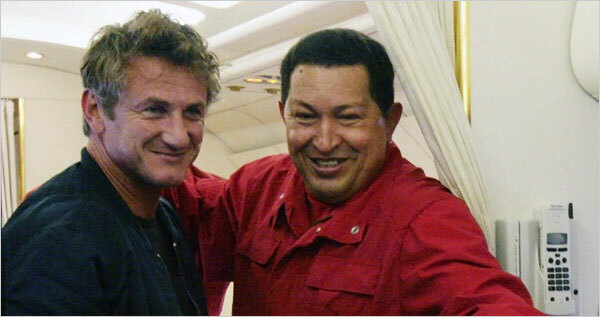 Sean Penn is undeniably a terrific actor and activist for many good causes. But his ambition to promote a socialist agenda has stripped him of his ability to have logical thoughts. He is still adored by the uneducated liberals, but by the majority of Americans and even immigrants his political ideology are reckless and self-promoting. So how did this adulation for a dictator start? Penn first started to support Hugo Chavez publicly during the Iraq War. Chavez’s vocal opposition to the Bush administration was right in the wheelhouse for Penn and many liberal elitists. Penn found Chavez to be a true leader to be proud of when Chavez called President Bush, “the greatest terrorist in the world.” Chavez embraced Penn for his stance on impeaching Bush in 2007. True love has never been so pure. Last month, while doing a round of interviews, mostly to talk about the good work he has been doing to help in Haitian rescue efforts, he was asked about his relationship with Chavez and his answer was peculiar. Some would say, communist. Obviously I take both points he made to be uneducated, lunatic ramblings at best. To claim press should go to jail for what he perceives as lies goes against every freedom he is afforded being an American citizen that all Venezuelans do not have. And to claim he has won 14 democratic elections transparently is just an outright lie. Lets not forget, Chavez immediately began revising the Venezuelan Constitution as soon as he was elected to give the government more socialist power and remove term limits from himself. …I’ve decided to set the record straight for you regarding the Chavez regime, supporting my case based not only on my political ideologies, but on proven facts you choose to ignore. Otherwise, I believe your position would be different. In the words of Michael Scott…”Boom. Roasted.” So, I ask again, which side do you think is truthfully portraying the conditions in Venezuela? The Venezuelans with family, friends and first hand knowledge of the events in their country, or the raging idiot, Sean Penn? Sean Penn in my opinion is a shining example of a radical leftist who is FINALLY(along with others) voicing their true beliefs. They are true socialists. Im okay with that as long as they don’t claim to be otherwise or hide their real intentions and leanings. Its just amazing that people as morally bankrupt as Penn can have national stages and be taken seriously by many people. His statements of wanting to jail people with dissenting beliefs (esp those that align with US values and constitution) are right in line with other far left people today. What boggles my mind a bit is how seemingly educated people can have views so ardently UN-American, and then make claims of media bias, collusion or whatever the hell.. Like honestly, what crazy irrational bubbles do you live in? What media do you read, and what friends do you keep… Mind blowing in his stupidity. I read an article a few years back about Chavez’s push to change the constitution for him to be dictator in effect for life. He was finally able to do that, through im sure unsavory means.. Not to mention he is nationalizing all major industry, including mining and building materials, ive only known that since i work in the industry..
Venezuela, like many countries in the area, will always be plagued with social problems than no amount of democracy will cure. It’s very easy to sit in a plush chair, open your MacBook, and write about how Chavez is everything that’s wrong with Venezuela, just as it is for Penn to argue the opposite. You forget though that Chavez has been ELECTED president three times. I’m sure you could argue that the elections were “influenced,” but then I would turn to our own democratic process and reference the Florida count and the Supreme Court decision that enabled Bush to begin his … um … ‘work’ for the country. All three times, in fair and clean elections, the man won. His proposals have garnered the support of voters another three times, so he has won six elections in less than eight years. Do you think Bush’s support was that solid? If so, It’s hypocritical to say Bush won both of his terms fair and square; and simultaneously reject the legitimacy of Chavez’s support. I understand concerns that he has nationalized major industry, but if you haven’t noticed, the U.S. Government has more employees and contractors than any other company in America. Just because they haven’t nationalized out big industries (Auto, banking, agriculture) doesn’t mean our government doesn’t have direct influences on them (you MAY recall something about bailouts). Yes, he pushed for changes that allowed him to stay in power longer, but so too did Bush and Cheney work to stockpile executive power while they were in office (not to mention planting people like John Roberts). The Bush administration’s claims of “executive privilege” in state secrets cases, for example, is something that the Obama White House is still using. Chavez is a visionary man who has achievable goals for his country and is working to help extremely poor Venezuelans far more than we do here in America. Regardless of your opinion of that vision or mine, he is the man taking steps for improvement. Just because it’s not falling into the framework of what America considers a “proper democracy” doesn’t make it wrong. That’s like the Jewish community telling the Catholics that they REALLY should be celebrating the Sabbath on Saturday. Quoting Ozzie Guillen … really? Ozzie was great middle infielder, and a superb manager. Quoting him as a political analyst just because he’s from the country is a bit much. That’s like the Iranian press quoting Bobby Night on his opinion. Who cares. The guy can barely articulate rational thoughts, in English or Espanol. If anybody thinks Fox put him on TV to analyze the World Series for any other reason other than the fact that he probably would say something controversial, or ridiculous … they are crazy. Guillen is a sideshow for the media. He Tweets like Hilary Duff. As far as quoting a beauty queen … I mean, come on, man. She could be writing that exact letter to Sean Penn about OUR government. Personally, I think his heated rhetoric is unnecessary, and I don’t like his authoritarian streak, but his people want him, and he has done lots for the poorest Venezuelans. So, no, he’s far from a dictator. Although facts similar to those didn’t help Saddam H, who was a true dictator. If Venezuela had a military worth mentioning we could just look for WMDs and call it a day I suppose. The hardest part about living on the left half of reasoning is thinking for yourself, just because you’re feeding from conservatism and sitting on the right, doesn’t make it so. Oh, Nick B – good to hear from ya, even if I disagree with you! You compare things to GW Bush a lot as well, I think Dan commented sort of what I was thinking so Ill avoid going point by point on that. I think your attempt to compare Bush appointing Roberts to Chavez getting laws revised and term limits rescinded is a big stretch. I am strongly fiscally conservative, and Bush let me down in a lot of areas there, so you wont hear me defend him much in that area. But even at his worst, how can you compare life in the United States, to the 71% povety rate, rolling blackout and penalities for energy usage, and the seizing of foreign companies by national government? Venezuela is rich in the world’s most precious resource, and yet Chavez doesnt use it to improve the country’s infrastructure or social programs. If he did, why the energy emergency? And why does a country with a strong economy face huge inflation and recently devalued their currency? He uses their resources to seize more control in the region. It’s about power to him, not improving his country. The shadiest part to me is the media control he maintains. You cannot tell me he isnt trying to hide something when he shutsdown the largest private TV station, takes control of most radio and newspaper outlets, and creates laws restricting gov’t criticism in 2005. Appreciate the differing opinion – always welcome. Thanks for checking us out. Hey Nick B good to see you on here! Thanks for adding your thoughts. I must say there’s a lot here about GW. Let me try and put together some kind of a response. No one is arguing that here, and although a democracy with a semi-free market is clearly the best option for most, i agree they dont always work that way. Look at the Gaza elections. A very fair point that i understand, but when you have a popular president selling that he will take care of people while changing its media to his liking, and nationalizing all of its major industries, its a very unfair fight. A welfare state is a noble idea that’s easy to sell, esp when you have the means to back it up. We should never forget that Chavez is not our ally, he’s co-horts with Mahmoud Ahmadinejad, the Castro Bros, has called our last two Presidents Satan, and has worked in conjunction with the ousted Honduran leader in his attempt to usurp their Constitution. And not to mention because of our American left, we’re forced use them as one of our top oil importers and continue to be held down by not just OPEC, but our own neighbors Canada and Mexico. Again thats not what we’re arguing, Chavev was elected fair and square for the most part, and i have my list of problems with GW but thats a whole other discussion. Actually i have noticed and so have millions more. I dont point to bad behavior with other bad behavior, and what u described is what spawned the tea party movement. No reasonable person is 100% against all govt, thats absurd. But not realizing bureaucracies wasteful tendencies, esp those that work to de-incentize people work against the ingenuity that created our standard of living. Let’s face it, even our military is bloated and wasteful. Doesnt make it right for either person. Not sure what you mean about planting John Roberts. Like how Obama planted Sotomayor and another this summer? Shocking that you would give such a complimentary description to someone who so steadfastly stands defiant against our country and against our country’s values. Yes every country has its own right to govern the way it chooses, but there is always a right and a wrong. Just ask the hundreds of millions who lost their lives fighting for or dying under Govt regimes in the 20th century alone. Is there a right or wrong in Cuba? Or is it better for them all to suffer a meager existence instead of face the prospect of an income gap? I assume you view the income gap and poverty line as evils in todays capitalist society? You referenced Chaven helping the poor a few times. Sorry for the digression i know this is a bit off topic now. Now i cant speak to Venezuela’s overal economy, from what i thought they were doing okay. But what i can speak to is the company he keeps, the policies he champions, and the road his “vision” has led to so many times in the past. First, I read this blog a lot, and have been hesitant to comment, simply because it’s really only fun to comment on things you disagree with a bit. This happens to be a subject I love, not because I love Sean Penn, or Hugo C for that matter, but because I think it’s a heavy subject to criticize another country, when ours is so flawed. I was simply trying to show parallels (and start a discussion of course…). Any not-so-conservative bro is kind of asking for it posting an opposition on here, I know. I avoided comparing Obama on purpose… I didn’t think it was fair since he was so fresh. The GW references were only because I’m a closed minded, un-educated liberal, and all things negative in politics can be traced back to the most evil President ever. (jokes are allowed right?). He was just our last double-term Prez… (who HAPPENED to be republican, and in my opinion didn’t do, what I would consider in any way, a very good job). As far as “planting”; maybe that was a stretch, but, in my opinion, it’s no coincidence that every member of the supreme court has nearly identical backgrounds. This why our fair lady from Michigan is being supported by member of both parties; she’s different (didn’t go to Yale or Harvard law to start… like every other current justice)(WAY off course, I know). If Ozzie Guillen, a book smart beauty queen, and a website ran by the MRC (quoting their website “America’s Media Watchdog”, which operates in the 10 million dollar range annually…. all of which I’m sure seems like a mute point) are the cornerstone references of the article , I feel silly for questioning them. It’s not that I don’t ‘trust’ the media, I just spent a fair amount of time in theater and saw first hand how stories are ‘adjusted’. I can only assume the same things happens in the political arena. I very well could be wrong. I agree completely when you talk about him shutting down the largest TV network, and controlling radio stations. He is hiding something, or filtering. America would never do that…? If you want a more fun, pop reference, watch ‘Pirate Radio’. America and England handled things like that in similar fashions in their own times. I don’t think it’s ‘right’ but it’s certainly semi-American-ish (but then again, so was slavery…) I am in no way saying that Chavez is the VERY BEST thing for his country. We could argue motivation of his actions until we were out of breath and none of us would be right. Calling him a “visionary with achievable goals” seems complimentary, I know. I wish I had worded that different (slightly). Johnny, the BQ probably has more book and street smarts than me (completely measurable attributes, and a solid argument in her defense), but I feel like you may still have the edge on her in both regardless. Besides, anytime I’m around a woman that immaculate I become almost silly. Her letter is well written though, and her points articulated clearly, but the way she navigates her opinion seems very…. edited. She has a great press agent I’m sure. Taking a shot at her was not fair, I admit, but it was fun quoting you, quoting a beauty queen… sorry. I know I will ‘lose’ this argument in this forum, but it wasn’t my intention to change your minds. I realize some facts I used to support my opinion weren’t things you were arguing, they simply helped my case (much as Ozzie Guillen helped yours). “Yes every country has its own right to govern the way it chooses, but there is always a right and a wrong.” I realize, morally, there is. I just happen to think that morals are personal. It would be great if we all had the same set. I realize this is an extreme analogy, but is a child born in the far east, deep in the country, who never is exposed to anything other than what the people in his family and village believe wrong? I could extend this to religion (which to me, is not so different, just another set of moral beliefs) but that would really leave the arena of the article (which btw, I enjoyed… I just didn’t completely agree with… or agree very much… whatever). Nick Barr… Long time. Your comments are always welcome not matter how opinionated or simple they may be. You just came out of the blue with what seemed like a very favorable opinion of Chavez. As far as judging countries and ways of life I think we can come to an agreement there. The only major difference may be our opinions of Chavez. Please don’t think about it as “losing” an argument. I think it is about coming to an understanding and perhaps gaining some perspective on your opinions. I think you did a very good job at explaining your side after a few over the top statements. Take care brotha, hopefully we will here from you again.